"The developers seem to believe that mastering their web of convolution is its own reward." The jury's still out on whether or not Natural Doctrine is the worst tactical RPG that I've ever played, but I can say with zero hesitation that it's certainly the messiest. It stacks arbitrary complication upon arbitrary complication and mistakes this for depth. It believes that the open acknowledgement of a sharp, unwelcoming difficulty curve excuses a game from being balanced and fair. It encourages us to familiarize ourselves with rules and systems that aren't adequately communicated, and then it punishes players who can't keep up, which is everybody, since the rules don't make sense to begin with. The interface is a mess, and constant design oversights make the inherent flaws of the combat even more senselessly frustrating. As a miscalculation, Natural Doctrine is impressively thorough. Perhaps I should show rather than tell. Have a look. This is what every eventful turn in Natural Doctrine looks like, and yes, some of the information in that screenshot is even upside-down. The funny thing is that, having spent a couple dozen hours with the game, I can tell you exactly what everything in that image means, and it still makes no sense. The whole driving force of Natural Doctrine is something called the "link system," and the game itself has trouble explaining how it works, so you can imagine how I feel right now. In a nutshell, the position and action of a unit can grant various bonuses to other units, the most prominent being extra moves. 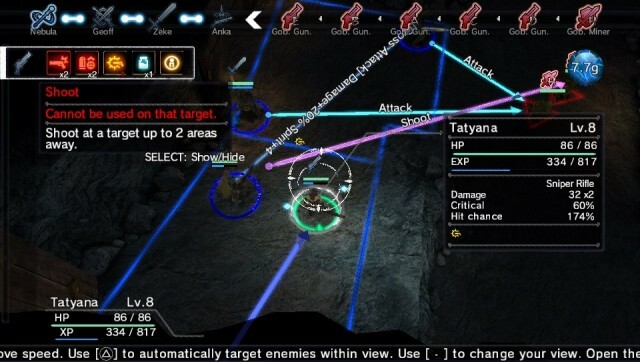 This is a turn-based game, but under certain conditions – which Natural Doctrine literally just tells you to go look up if you're interested – multiple units can move simultaneously and thus coordinate larger, more effective attacks. That's what the colored lines in that screenshot are supposed to signify, beneath the action menu, the turn queue, an instructional marquee, something being measured in grams and the same character information being displayed in two different places. The gist of the system is that you're supposed to be moving and attacking as a group. Earning extra turns requires the host unit to be performing an action and be situated next to other units, so staying together and remaining productive is key. What's the problem with this system? Well, think about it. If every move by every individual unit can potentially grant an extra move to every neighboring unit as well, then suddenly "strength in numbers" becomes borderline exponential. Having more units doesn't simply translate to having more firepower; it means more time spent on the offensive. So while this system is reasonable when the stakes are even, anytime your group is outnumbered, which is often, Natural Doctrine becomes infuriatingly unbalanced. This issue is compounded by a couple of absolutely baffling functional decisions. Firstly, you lose a battle if anyone on your team dies, without the option of reviving them or, hell, just continuing on with one fewer person. Enemies are aware of this and will frequently gang up on your weakest units, meaning that Natural Doctrine is unforgiving of any and all mistakes. What's even worse, however, is the annoying fact that your melee units will sometimes move without your permission. Rather than being grid-based, Natural Doctrine's level are divided into larger zones that can fit up to four characters each, positioned however you like. When a group of melee units defeats all of the enemies in a neighboring space, they'll then automatically migrate to that space, even if, say, this puts them in a position of vulnerability that they wouldn't have been in otherwise. In one case, one of my swordsmen killed a lone goblin by countering one of said goblin's attacks and then rounded a corner without my input, walking directly into the line of fire of several gunners who then ended the match in an instant. Boom – progress lost based on nothing I actually told my characters to do. The melee combat is kind of a disaster all around, in fact. The link system fools you into believing that positioning is important (since you'll get an attack boost when linked units are farther away), but then the characters all re-align themselves for the attack animation and everyone in the zone is equally vulnerable. Melee characters without good defense (those wielding two-handed swords, etc.) are borderline useless, since they can't attack without putting themselves at risk and, lest we forget, one death is all it takes to lose a battle. Thankfully, the ranged combat pretty much works as it should. Gunners never move without your permission, and unit positioning and line-of-sight play a big role in both your ability to line up attacks and your ability to take cover from them. A gunner will hit an allied unit if they fall into the line of fire, and characters can guard one another from ranged attacks themselves. This is all fine. But Natural Doctrine is very, very hard, and its many imbalances in functionality drive it into "unfair" territory. Again, design that complemented the game's demand for even stakes would have helped, but too often, your team of only a handful of fighters will be overwhelmed by the enemy's advantage in numbers. Since the link system even grants extra movement when used properly, a large group of enemies can march across an entire map in nearly the amount of time it takes just to organize a defensive line. As if Natural Doctrine wasn't confused enough already, developer Kadowaka Games added dungeon-crawling elements to the mix as well. Story missions are straightforward enough, but the world map is heavy on questing regions that can be explored for loot and additional battles. Now, for one thing, tactical RPGs and dungeon crawlers don't mix; movement is slow and stilted, and so navigating massive networks of caves is an arduous process of moving each of your units two spaces at a time. There's also the fact that the loot is consistently both sparse and underwhelming; with the amount of time you're expected to spend dungeon-crawling, you'd at least expect to get something cool for your trouble. But the big issue is, as always, balancing and design. Dungeons are full of traps and surprise ambushes that are impossible to be ready for and, in some cases, impossible to react to. In one case, I opened a door and was immediately greeted by twelve enemy goblins, and because the link system allows them all to move simultaneously, they had no trouble whatsoever killing one of my characters – for one is all they need to kill – before I had the chance to so much as move into a defensive position. Checkpoints exist, but they're infrequent and, particularly in the dungeons, get dropped at inconvenient moments, like when you've cleared a room of enemies but haven't opened all of the chests yet, which means that you need to slowly trudge around and collect all of your loot again every time you die. I heard that Natural Doctrine's director expressed an ambition to mirror the depth and harshness of Dark Souls with this release. If that's true, he misunderstands what makes Dark Souls popular. For one thing, it had an absorbing, fascinating world that made its frustrations worthwhile; you'll notice that I've said nothing about Natural Doctrine's story, which is as much time as it deserves. More importantly, though, there was purpose and flow to that game's systems, whereas Natural Doctrine's claim to fame is complexity for its own sake. The developers seem to believe that mastering their web of convolution is its own reward, but instead, it's just a pointlessly frustrating bore. I'm reviewing it and I couldn't even finish it. I can't imagine trying to play it for fun. P.S. Natural Doctrine has been released across all three Sony platforms and supports cross-save. It works fine, but the game appears to be a straight port across all three systems, and it only looks passable as a Vita title, which means it's hideous on PS4. I wound up punching through it primarily on Vita since there's no real advantage to playing it on a bigger screen. If you enjoyed this Natural Doctrine review, you're encouraged to discuss it with the author and with other members of the site's community. If you don't already have an HonestGamers account, you can sign up for one in a snap. Thank you for reading! You know, on paper, this was the kind of game I could have really gone for, but I'll stick to my super hard twitch-fests and evil labyrinth minmax games then, thank you very much. I... kind of want to see you review this now. You'd hate it even more than I did. Let's see if I can find my VITA. Oh no! I bought a PS4 to play the best version of this game! None of the material contained within this site may be reproduced in any conceivable fashion without permission from the author(s) of said material. This site is not sponsored or endorsed by Nintendo, Sega, Sony, Microsoft, or any other such party. Natural Doctrine is a registered trademark of its copyright holder. This site makes no claim to Natural Doctrine, its characters, screenshots, artwork, music, or any intellectual property contained within. Opinions expressed on this site do not necessarily represent the opinion of site staff or sponsors. Staff and freelance reviews are typically written based on time spent with a retail review copy or review key for the game that is provided by its publisher.